Paris is a magical city to me. I am so inspired by the beauty and the architecture. If you have the chance to go to Paris take a walk around the city at night. Take a cruise along the Seine or just walk down the streets. If you have the opportunity visit the Louvre at night. It has to be my favorite. There is something magical about the Louvre at night. So please join me on a walk through Paris at night. A good friend of mine is leaving for London and Paris this Friday. She asked me to come up with places to go in the city to recommend. Since I am writing something up for her I figured I might as well share it with everyone! 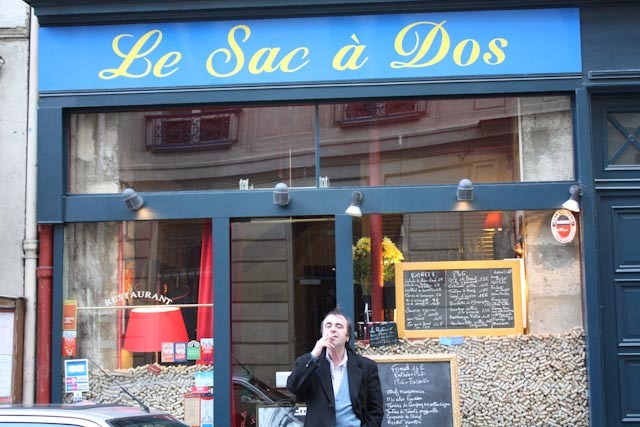 Le Sac a Dos – This was recommended to me by my hotel my first night in Paris. I was very hesitant because they told me it was right next door. I was in Paris and I figured one of the best restaurants couldn’t be just right next door. This tiny restaurant has about 5 tables in the front and a few in the back. 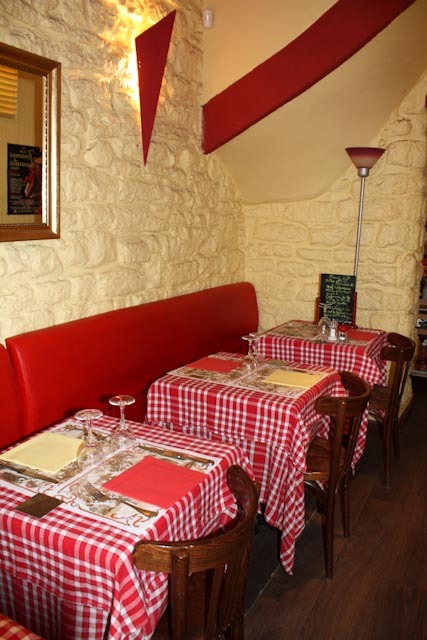 The table cloths are red and white checkered and the menu is updated fresh everyday and the specials written on a chalkboard. The owner visits the market at 5am every morning for fresh ingredients. The prices are extremely reasonable. You can get dinner for around 20 euros. I recommend the escargot, the lamb, and the chocolate moose. Its very easy to find you can take the Varenne metro stop and the street is 47, rue de la Bourgogne. The most famous ice cream location of Berthillon is on Il St Louis. Be prepared to stand in line but its worth it! You will pass a sweet shop (its all yellow inside and out) stop in and have a look around while you wait in line. Take your ice cream and walk along the Seine. It makes for a perfect day. 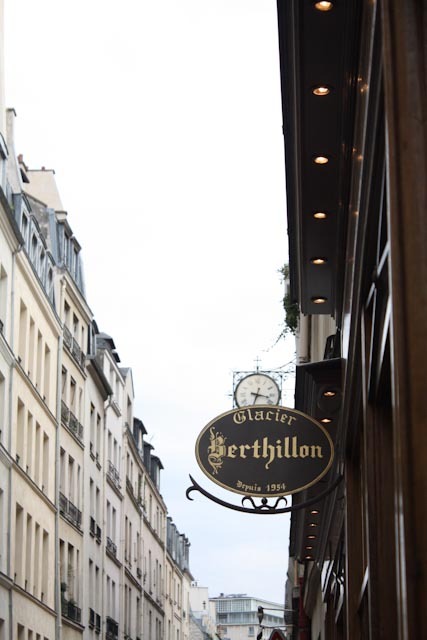 There are many locations that sell Berthillon but this is the most famous and has great scenery. If you only visit Il St- Louis for Berthillon its worth the hike! Walk around the Latin Quarter around Happy Hour and you will find live music and the streets packed with people. Bars and restaurants put outside seating the cobblestone streets. Come early to score a good seat and great people watching! Paul is found all over Paris and there are even a few locations in London. When in doubt you are hungry and looking for a quick breakfast or lunch pastry or sandwich this is the place. Versailles – Worth the day trip! I would recommend getting to Versailles bright and early. I think the gates open around 10am. The train ride is really easy and takes you right into town. You can buy your tickets on site or while you are walking towards the grounds. I bought mine on the walk and it saved me over an hour standing in line. I would also check into seeing if you can use your Paris City Pass to get in. You can spend all day here. There are several places for lunch as you walk down the gardens. Grab a sandwich and pick a place in the park to people watch and take in the sites. Don’t forget to explore ALL of Versailles. Marie Antoinette had several houses built on the grounds of Versailles and this is included in the ticket price. The Tulleries: A garden and gathering place in front of the Louvre. Enjoy the Louvre for its beauty without waiting in long lines. You may have visited the Louvre in the past but its fun to stop by and hang out in the touleries. Grab a green chair and sit and chat with some of the locals. Luxemboug Gardens is a great place to walk around and mingle with the locals. People of all ages gather here to sit by the fountains or garden. Kids play games, adults play tennis, and some of the older residents play chess. I am known for being awful with directions but The Paris Metro is one of the easiest transit systems I have ever been on. Its easy to use and very cost effective. You can buy tickets individually or in packs of 10. Have fun and don’t forget to get lost!! Some of my best photographs are from me wondering the streets of Paris and just exploring what the city has to offer!